Exeter moved up to second in the Premiership table with victory over leaders Northampton, who were beaten for only the second time this season. Luke Cowan-Dickie's early try put the Chiefs ahead, before two Stephen Myler penalties narrowed the gap to a point. Tommy Waldrom went over twice, while Gareth Steenson took his tally to six points as Exeter led 21-6 at half-time. The hosts hit back with scores by Tom Stephenson and Jamie Elliott but the Chiefs hung on for a thrilling victory. Exeter created some early possession, with Saints full-back Ben Foden required to pull off a try-saving tackle to deny Jack Nowell within the first 30 seconds, and it was no surprise when the visitors went ahead soon afterwards. A brilliant lineout drive saw Cowan-Dickie force his way over, with Steenson adding the extras, before Myler quickly cut the gap to four points with a penalty. The hosts slowly got into their stride and Myler's second penalty made it a one-point game, but Waldrom intercepted a pass and ran in from the halfway line to touch down for Exeter's second. Steenson's conversion gave his side a 14-6 lead. Exeter had a try disallowed but, from the resulting five-metre scrum, Waldrom powered over for his second try and Steenson's third successful kick from three gave the visitors a 15-point advantage at the break. Steenson scored the first points of the second half with a penalty, before Ryan Wilson's inside offload set free Stephenson to go over and give the home side hope. Elliott wriggled over in the left corner after great work from Stephenson, while at the other end Steenson missed a drop-goal attempt. 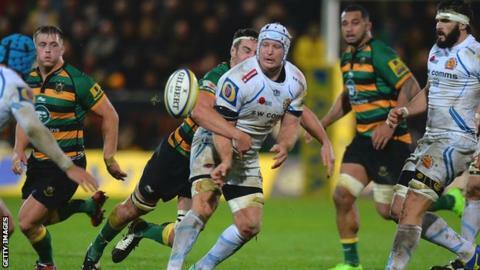 It did not matter, though, as Exeter recorded an impressive victory away from home. "We conceded a really sloppy try from the kick-off and then gave away an interception try. "We talked about their line speed during the week and we struggled with that. "They came with a very simple game plan to kick most of their ball away and then take their opportunities and they did it well." "We are level-headed enough to know that if we were going to have a good season, then this was an opportunity to come to Franklin's Gardens and pick up four points, because we are all very aware that they have a lot of good players missing. "The kicking and set-piece battle was always going to be key in these conditions and I think we deservedly edged that. "Thomas (Waldrom) has just proved what he is, which is a good player. We knew when we signed him he was still a good player and he still has plenty left in the tank." Northampton Saints: Foden; Elliott, Stephenson, Burrell, Collins; Myler, Dickson; M Waller, Haywood, Ma'afu; Manoa, Day; Clark, Butley, Dowson (capt). Replacements: McMillan, E Waller, Denman, Woolford, Harrison, Hodgson, Wilson, Waldouck. Exeter Chiefs: Dollman; Nowell, Slade, Hill, Jess; Steenson, Chudley; Rimmer, Yeandle, Francis; Mumm (capt), Welch; White, Armand, Waldrom. Replacements: Cowan-Dickie, Moon, Low, Caldwell, Horstmann, Thomas, Whitten, McGuigan.